Great deals on auto. Purchase the Camco Olympian RV Wave-3 LP Gas Catalytic Safety Heater. Only $180.00, regularly priced $212.99 + Free 2-Day Shipping AND Free Store Pickup. 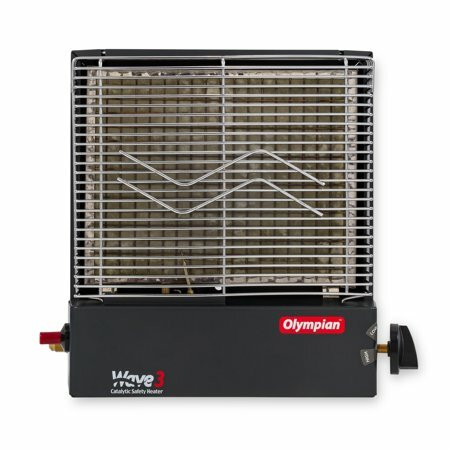 Keep your RV or camper comfortably warm with the Camco Olympian RV Wave-3 LP Gas Catalytic Safety Heater. Suitable as a secondary or primary heating source, it produces enough heat to warm up to 130 sq ft of space. The Olympian Wave-3 catalytic safety heater operates on low-pressure gas and can be wall-mounted or used as a portable unit. It’s also equipped with a 100 percent safety shut-off valve to prevent accidental non-ignitions fuel discharge. It uses a high-quality material that heats up without giving off harmful emissions. The built-in automatic Piezo electric sparker lasts up to 20,000 starts. There’s no electrical drain or battery connection, allowing for easier set-up. This LP gas catalytic heater is adjustable from 1600 to 3000 BTU per hour to meet your needs as the days get colder. Catalytic heating is 99.98 percent efficient (flame type heaters waste up to 45 percent of all heat produced), resulting in a more efficient heat. No fan or blower allows the unit to work silently.